The South African Republic was annexed by Britain in 1877, and became the Crown Colony of the Transvaal. SAVA published a Journal entitled "The Union Jack over Southern and Central Africa, 1795 - 1994" in 1994 which covers all these flags (and those used in what is now Zimbabwe, Lesotho, Botswana, Malawi etc). For the Zuid-Afrikaanse Republiek (Transvaal) under British Administration (1877 - 1881), a Colonial badge was prepared but a flag was never taken into use. 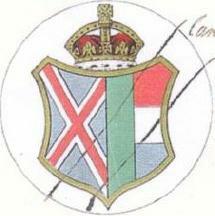 Proposed badge for Union Jack of British Administrator Transvaal: cancelled 1884. It was based upon a supposed Public Seal. When the Admiralty were informed that no Public Seal had been approved for Transvaal the badge was cancelled. Seems like the dexter part is a Union Jack without St. George's cross. On second thought, maybe it was the so called "Burgers flag"? (the national flag of the Zuid-Afrikaansche Republiek from Oct. 1874 till May 1875. You illustrate the flag of the Transvaal after the Anglo-Boer War, as a blue ensign with a badge of a lion. This flag never existed, not even on paper. It is an assumption made on the basis of common practice elsewhere, and erroneously attributed to this case. No Admiralty warrant exists for it. If it were used on a flag at all (and I seriously doubt that it was) then it was a circular badge in the centre of the Union Flag. Michael Faul is of the opinion that no Transvaal Blue ensign after the Anglo-Boer-South African War of 1899-1902 actually existed. He is correct in saying that no Admiralty Warrant existed for this flag but the badge is illustrated in Flags, Badges and Arms of the British Dominions beyond the Seas (Part I - Flags and Badges (HMSO, 1910). Brownell in The Union Jack over Southern and Central Africa 1795-1994 states that usage of this flag was probably limited given the political situation at the time. Certainly the Cape and Natal colonies had distinctive ensigns so it is not unreasonable to assume that the Orange River Colony and the Transvaal should have done likewise. Given that the Union of South Africa was shortly to follow in 1910, it is not surprising that no Admiralty Warrant for a flag was issued. As far as I know colonial (and departmental) Blue Ensigns were the subject of internal Colonial Office/Home Office/Admiralty arrangements and no warrants were ever issued for them. Warrants were issued only for colonial Red Ensigns, yacht club ensigns, and merchant ship Blue Ensigns granted under Naval Reserve and Admiralty subvention regulations. They were required by law in order to comply with merchant shipping legislation. The Transvaal badge was added to the 1889 Admiralty Flag Book, as an amendment, in February 1904, and included in the 1907 edition. "Despite the fact that the Colony certainly had no shipping of its own, by 1905 its colonial flag device was even to be found included in the Imperial German Navy's Flag Book. For years after Union, the Transvaal Colony's Red Ensign was also still to be found depicted in flag books." It is most unlikely that the State Herald (as Brownell was in 1993) would knowingly publish information on a non-existent flag. The badge, he states, came from the colonial seal. Both seal and badge are illustrated on my page ­ illustrations scanned from National and Provincial Symbols. Incidentally, whether or not the Blue Ensign was much used in the Transvaal, there would almost certainly have been a Union Jack defaced with the badge, since the Governor, Lord Milner, lived in Johannesburg during most of the period from the annexation of the Zuid-Afrikaansche Republiek until his resignation. Milner (Sir Alfred when he was first made Governor of the Orange River Colony) resigned as Governor of the Cape so that he could take personal charge of arrangements in the former Boer republics, although he retained his position as High Commissioner. When he was made Governor of both the ORC and the Transvaal, he appointed Administrators for the two colonies. The Administrators lived respectively in Bloemfontein and Pretoria, and reported to him on their activities. Although Pretoria remained the seat of administration for the Transvaal, Milner preferred to remain in Johannesburg. The basic objection to this design is that it was never warranted by the Admiralty. Only the Admiralty could authorise a defacing badge on either the blue or the red ensigns. From a series of Cigarette Silks Iron-on Transfers, the subject of which is: Nation Animals & Flags, the fancyful flag of Transvaal. The Transvaal certainly didn't use a hippopotamus as a symbol at any time, nor the flag illustrated.